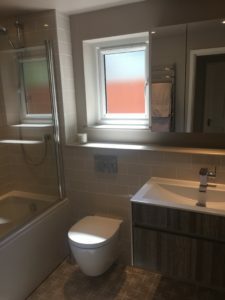 I have been enjoying my new bathroom for some weeks now, so thought I would share the completed room with you. It is quite tricky to take photos of a bathroom when it is quite a constricted space, as it is impossible to get a good angle to show the room as a whole, but these give some idea of the finished product. I chose wall hung sanitaryware, as the more floor you can see the more spacious the room feels. 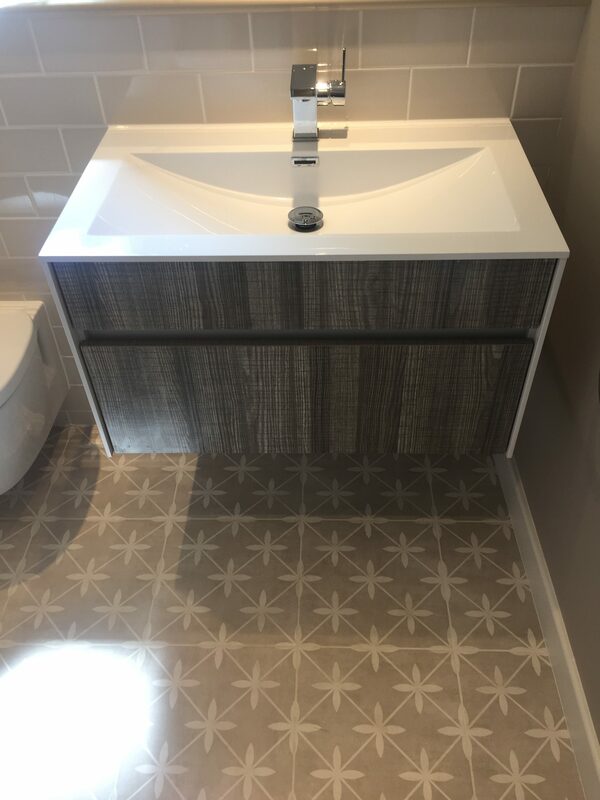 A large wall hung vanity unit the ‘Mirage’ by Lusso Stone, offers good storage which is really needed in small bathrooms, together with an over sized mirrored cabinet above which also serves to bounce lots of light into the room. By choosing materials with reflective qualities it makes the room feel a lot brighter. The vanity unit, metro wall tiles and sanitaryware are all gloss finish, together with the chrome taps and flush plates. 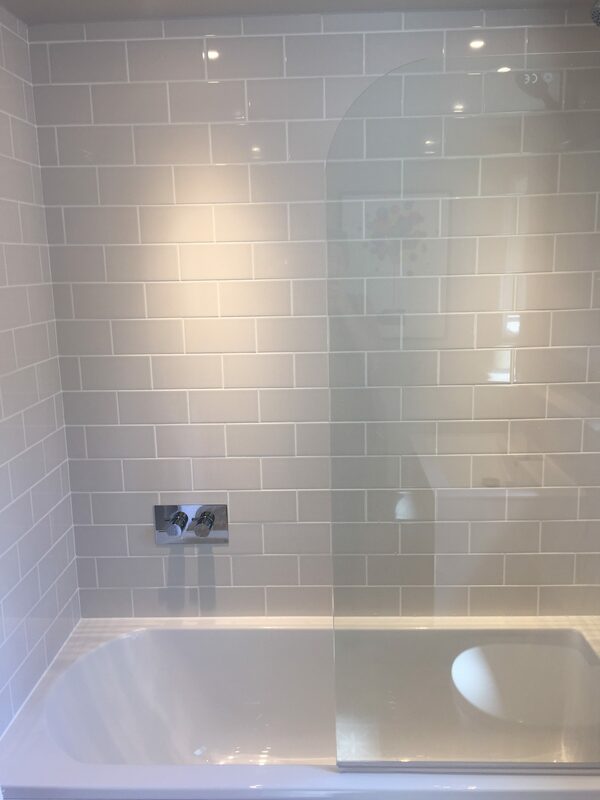 Angled down lights wash down the metro tiles behind the bath and are also placed to light the top of the vanity unit, WC and towel warmer. The dual fuel towel warmer I selected has lots of space between the bars. 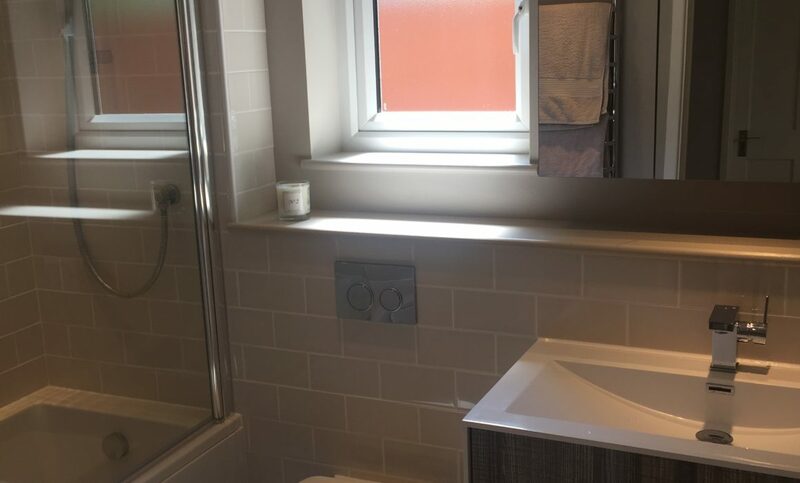 Often towel warmers only have a few slim spaces which is not sufficient to hang everyones towels when you have a family. 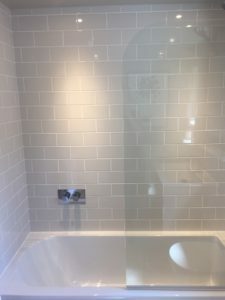 Originally there was a small separate shower in the corner of the room and a separate bath, but it made the room feel incredibly cramped so I decided to install the shower over the bath to free up space. 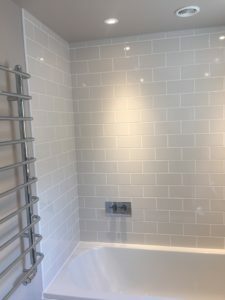 I placed the bath and shower valves towards the head of the bath, so that you can turn on the shower easily and adjust the temperature before stepping in, and it also allows you to top up the hot water easily when bathing. 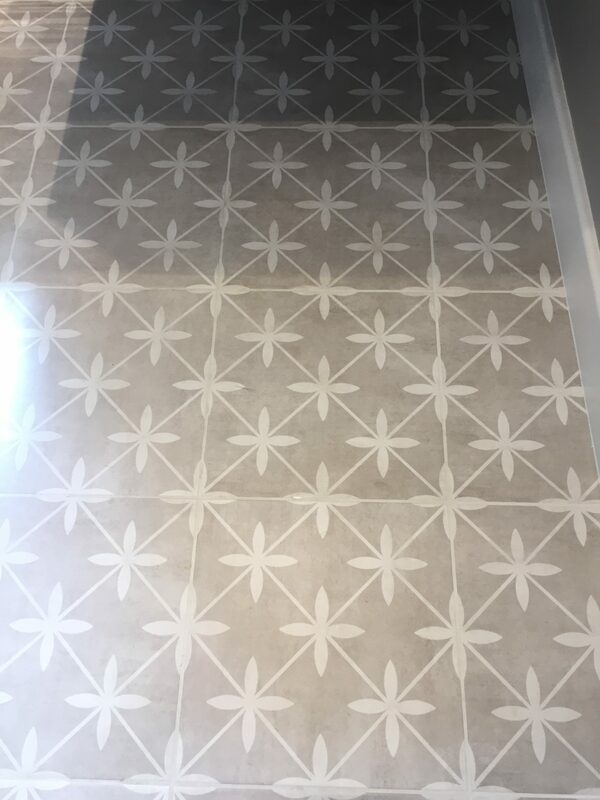 I selected soft grey patterned floor tiles by Laura Ashley, to bring a bit of fun and interest to the floor. 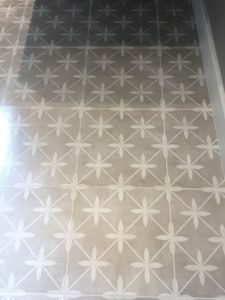 I didn’t choose gloss for the floor as I wanted a softer finish. I tiled behind the bath and WC and vanity unit with gloss Johnsons prismatic metro tiles in ‘Rice’, but the rest of the walls and ceilings were painted in Farrow and Ball ‘Elephants Breath’, which is much softer than tiling the whole room. To bring more natural light in the window was made taller and replaced by a casement rather than a top hung, and for privacy the glass was sandblasted. The ledge of the boxing and window cill was painted in Elephants Breath to match the walls, as I didn’t want to draw attention to these areas by painting them white which would be the traditional choice, and these were then varnished to prevent marking. The door to the bathroom was re hung to open out into the hallway rather than into the room to make the room feel larger. Now the bathroom is complete, its time to start planning the kitchen and living room!